A revitalised Leicester beat Swansea to secure a third league win in succession and move off the bottom of the table for the first time since November. 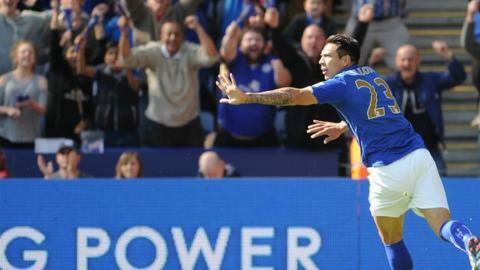 The Foxes took the lead when Wes Morgan knocked down a long ball forward to allow Leonardo Ulloa to slam in a shot. Swansea were second best but almost equalised only for Kasper Schmeichel to crucially save from Nelson Oliveira. Andy King eased Leicester nerves when he slotted in after Lukasz Fabianski parried an Esteban Cambiasso free-kick. The home fans were singing 'we are staying up' after King's goal and, on current form, it is hard to argue against them. Having been written off by many in their survival fight, nine points from nine have flipped Leicester's fortunes around to the point that a win over Swansea by a three-goal margin would have moved them out of the relegation zone. They were a goal short but will be optimistic about avoiding relegation considering the level of their performances and with three of their last six games against rivals Burnley, Sunderland and QPR. Four of their remaining matches are also at home and, judging by the fervent atmosphere Foxes fans created against Swansea, that could prove crucial. Leicester are moving in the right direction compared to other teams in the relegation scrap and again showed the momentum they are enjoying with a showing of pace and energy Swansea struggled to deal with. The home side were tigerish and tenacious from the start and had 65% of possession at the quarter-of-an-hour mark just before their efforts were rewarded with the opening goal. Ulloa, who was only playing because of an injury to David Nugent in the warm-up, struck when defender Morgan held up a long pass before shielding the ball to allow the striker to slam in a shot for his first league goal since Boxing Day. Marc Albrighton almost added a second goal for Leicester only to send a shot on the turn narrowly wide. Foxes forward Andrej Kramaric also went close with a curling effort for the home side whose main concern was their failure to capitalise on their chances. Oliveira nearly punished the Foxes when he went through on goal, only for his shot to be saved by the outstretched left foot of Schmeichel. The home side's nerves increased when Jamie Vardy was denied a penalty following a foul by Ashley Williams before King's goal secured the three points. "We probably got out-fought which I haven't said too many times this season. "We knew with the crowd and recent results that the intensity would be high in the first 20 minutes and we didn't really get a grip of it. "Nelson Oliveira had a great chance and he did well to stay on his feet. If we had got a goal then the atmosphere would have changed." Match ends, Leicester City 2, Swansea City 0. Second Half ends, Leicester City 2, Swansea City 0. Goal! Leicester City 2, Swansea City 0. Andy King (Leicester City) right footed shot from very close range to the bottom left corner following a set piece situation. Attempt saved. Esteban Cambiasso (Leicester City) left footed shot from outside the box is saved in the bottom right corner. Jonjo Shelvey (Swansea City) is shown the yellow card for a bad foul. Foul by Jonjo Shelvey (Swansea City). Attempt missed. Wes Morgan (Leicester City) header from the centre of the box misses to the left. Assisted by Marc Albrighton with a cross following a corner. Corner, Leicester City. Conceded by Lukasz Fabianski. Corner, Leicester City. Conceded by Nathan Dyer. Attempt missed. Jamie Vardy (Leicester City) right footed shot from the centre of the box is high and wide to the right. Assisted by Riyad Mahrez. Attempt missed. Jamie Vardy (Leicester City) header from the right side of the box misses to the right. Assisted by Ritchie de Laet. Substitution, Swansea City. Marvin Emnes replaces Nélson Oliveira. Substitution, Leicester City. Daniel Drinkwater replaces Andrej Kramaric. Foul by Nélson Oliveira (Swansea City). Attempt saved. Riyad Mahrez (Leicester City) left footed shot from the centre of the box is saved in the centre of the goal. Assisted by Jamie Vardy. Corner, Swansea City. Conceded by Wes Morgan. Attempt blocked. Jefferson Montero (Swansea City) right footed shot from the centre of the box is blocked. Assisted by Gylfi Sigurdsson. Angel Rangel (Swansea City) wins a free kick on the right wing. Substitution, Swansea City. Nathan Dyer replaces Wayne Routledge. Substitution, Leicester City. Riyad Mahrez replaces Leonardo Ulloa. Attempt saved. Jonjo Shelvey (Swansea City) right footed shot from outside the box is saved in the bottom left corner. Assisted by Gylfi Sigurdsson. Corner, Swansea City. Conceded by Ritchie de Laet. Attempt saved. Nélson Oliveira (Swansea City) left footed shot from the centre of the box is saved in the centre of the goal. Assisted by Gylfi Sigurdsson. Substitution, Swansea City. Jefferson Montero replaces Ki Sung-yueng. Attempt missed. Gylfi Sigurdsson (Swansea City) right footed shot from outside the box is high and wide to the left from a direct free kick. Attempt missed. Andrej Kramaric (Leicester City) right footed shot from the centre of the box is high and wide to the right. Assisted by Jamie Vardy. Attempt missed. Leonardo Ulloa (Leicester City) header from the centre of the box is just a bit too high. Assisted by Jamie Vardy with a cross. Attempt saved. Jonjo Shelvey (Swansea City) left footed shot from outside the box is saved in the top left corner. Assisted by Nélson Oliveira. Attempt missed. Andrej Kramaric (Leicester City) right footed shot from outside the box is close, but misses the top right corner. Assisted by Marc Albrighton following a fast break. Attempt saved. Jeffrey Schlupp (Leicester City) left footed shot from outside the box is saved in the bottom right corner. Assisted by Jamie Vardy. Attempt missed. Marc Albrighton (Leicester City) left footed shot from the centre of the box is close, but misses to the right. Assisted by Jeffrey Schlupp with a cross. Second Half begins Leicester City 1, Swansea City 0. Substitution, Leicester City. Ritchie de Laet replaces Marcin Wasilewski. First Half ends, Leicester City 1, Swansea City 0.